Santa Ana, Culver City, and Manhattan Beach drivers will receive a remarkable experience for the price in a 2017 Toyota Camry. 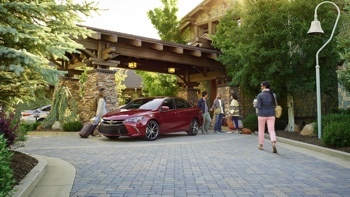 With high-end features available and even the entry-level LE possessing plenty to make you smile, the Camry is sure to please. Here’s a quick overview of what’s on offer. With a starting price of just $23,840*, the Camry SE is only slightly pricier than the entry-level model, but it provides drivers with a number of exciting extras. Sport-tuned suspension comes standard for a smooth and controlled ride, and the synthetic leather upholstery and leather-trimmed steering wheel provide a luxurious sensory experience. Starting at $26,310*, the XSE brings a fantastic selection of upgraded technologies and enhanced fittings. From the outside the vehicle stands out from the crowd thanks to 18-in. alloy wheels and LED running lights, but things become even more impressive once you slip inside. Starting at $26,310*, the XLE is similarly equipped to the XSE, but it boasts full leather upholstery and borrows the LE’s comfort-oriented suspension tuning. Santa Ana, Culver City, and Manhattan Beach drivers can find all four trim levels of the 2017 Toyota Camry here in the showroom at Marina Del Rey Toyota. If you still need help deciding, give us a call at (888) 834-3068. *MSRP excludes the Delivery, Processing, and Handling Fee of $865 for Cars, $940 for Small/Medium Trucks (Sienna, RAV4 Gas, RAV4 Hybrid, Highlander Gas, Highlander Hybrid, 4Runner and Tacoma), $1,095 for Large SUVs (Sequoia, Land Cruiser), and $1,195 for Large Truck (Tundra). (Historically, vehicle manufacturers and distributors have charged a separate fee for processing, handling and delivering vehicles to dealerships. Toyota’s charge for these services is called the “Delivery, Processing and Handling Fee” and is based on the value of the processing, handling and delivery services Toyota provides as well as Toyota’s overall pricing structure. Toyota may make a profit on the Delivery, Processing and Handling Fee.) Excludes taxes, license, title and available or regionally required equipment. The Delivery, Processing, and Handling Fee in AL, AR, FL, GA, LA, MS, NC, OK, SC and TX will be higher. Actual dealer price will vary.